Way back in 1956 a decision was made to create a common design stamp issue for the European community. The idea was not only to promote the rewarding pursuit of philately, but also to educate people in the history of Europe and the common roots that Europeans share. Thus the EUROPA stamp issue was born. Initially, there were six participating countries: Belgium, France, Germany, Italy, Luxembourg, and Netherlands. All participating countries issued stamps of the same design to be produced in their own countries, using their own printing techniques and engravers when applicable. 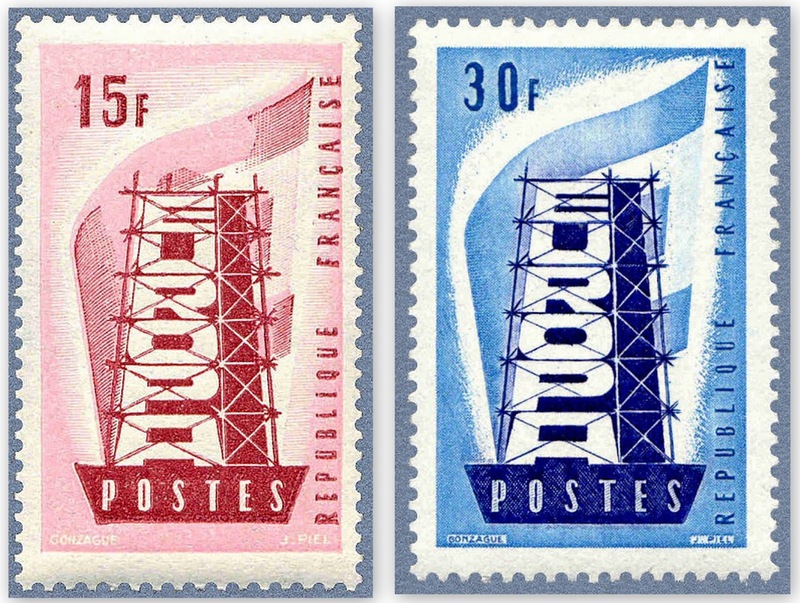 The common design chosen for the first EUROPA issue was a tower in the form of the 6 letters of the word EUROPA. The design was created by Frenchman Daniel Gonzagu. France's first EUROPA stamps were issued in two values, and the 'common' design was engraved by Jules Piel. 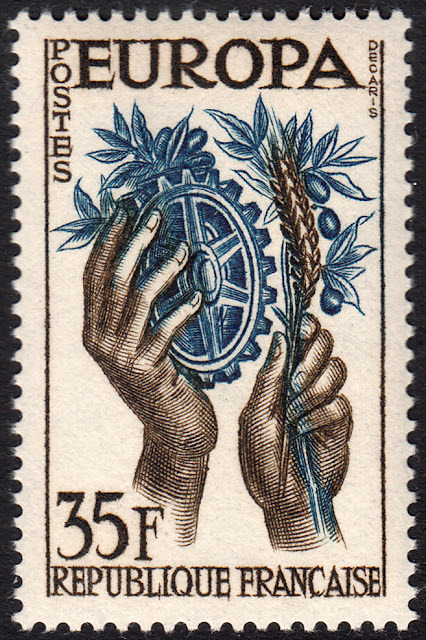 In 1957 EUROPA allowed participating countries to issue stamps based on the common "theme" instead of a common design. The theme was Peace and Welfare through Agriculture and Industry. This idea of providing the participating countries with just a theme gave individual designers freedom to come up with their own artistic interpretation of the theme. Incidentally, the number of participating countries had now risen to eight to include Saarland and Switzerland. 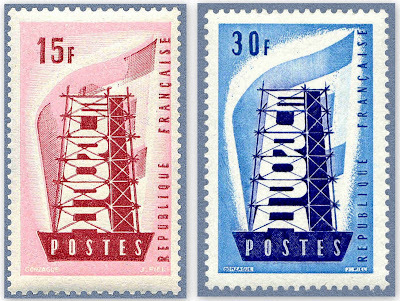 On 16 September 1957, France issued its EUROPA design, printed in two values. The issue was designed and engraved by Albert Decaris. Decaris has brilliantly captured the essence of the theme in his design. It features two hands. One hand is holding an olive branch and wheat, symbolising peace and prosperity through agriculture. The other hand holds a large gear, through which another olive branch is entwined. Machinery and nature are here almost one with each other in a symbiotic relationship.